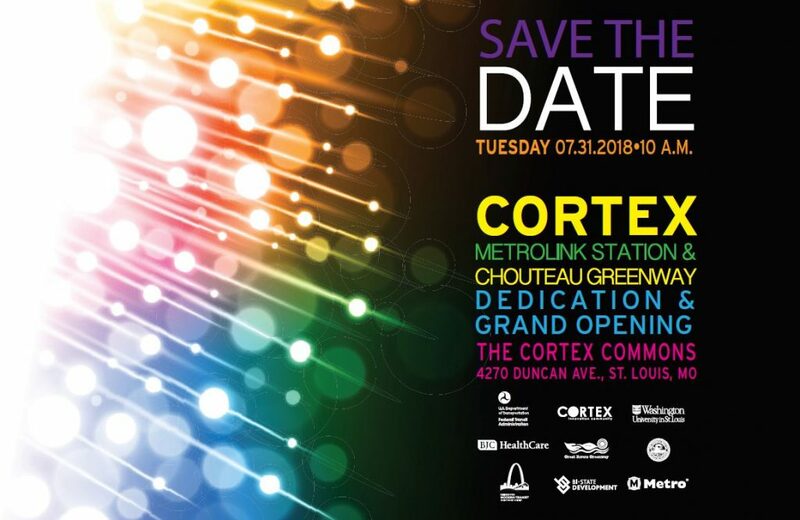 The Cortex MetroLink Station and the first quarter-mile section of the Chouteau Greenway will open to the public during a special dedication ceremony on Tuesday, July 31. Construction of the region’s newest greenway, and the first MetroLink station to be built in more than a decade, began last summer. This is the first Metro Transit project to be constructed using public and private funding. The Cortex MetroLink Station – located between the Central West End and Grand MetroLink Stations – will become the light rail system’s 38th MetroLink station and provide a new, convenient transportation option for the thousands of employees and visitors in the central corridor of St. Louis where parking is at a premium. The first quarter-mile section of the Chouteau Greenway has been constructed just north of the Cortex Station between Boyle and Sarah Avenues. When the entire five-mile greenway is completed, it will allow individuals, groups and families to walk or ride bicycles from the Gateway Arch to Forest Park on a paved, accessible path separated from street traffic. Adding a new station will change the time schedule for arrivals/departures for all of the stops. When will the new schedule be published. The change should only be a minute or two but that could make all the difference when you are trying to catch a train. Karen, we expected the schedules to add about an extra minute of travel across the light rail system. The MetroLink schedule was modified in anticipation of the Cortex MetroLink Station opening on June 24. Will the CWE station be closing? The Central West End Transit Center is not closing. I’ve heard that some bus routes are being eliminated as a result of this opening. Is this true? Will the #80 be eliminated? Hey Anne! There are no MetroBus routes planned to be eliminated as a result of the opening of the Cortex MetroLink Station. Hi Matthew! Thank you for your prompt replies. I was wondering if it would be possible for the Metro Link drivers to announces which bus lines will be connecting at the new Cortex station. I was on Metro yesterday and a couple next to me remarked as we passed through the Cortex Station that they wish they knew which buses were going to connect there. They had genuine interest in the station, but weren’t sure how they might actually be able to use it. Auggie, you are most welcome. At this time, there will be no MetroBus connections to the Cortex MetroLink Station. If that changes, we’ll makes sure to let you know. What date/time do the trains actually begin using the new station? Will a person be able to ride the train to the Grand Opening gala on Tuesday? If not, what’s the nearest bus stop? Hey, Farikh! MetroLink trains will serve the Cortex MetroLink Station at the beginning of service on Tuesday, July 31. So, yes, you’ll be able to ride MetroLink to the Grand Opening event! We hope to see ya there. is there a public parking lot available at Cortex station? overnight parking? There is not public parking available at the Cortex MetroLink Station. However, there is public parking at the Grand MetroLink Station, one station to the east of the Cortex MetroLink Station. The Grand MetroLink Station does not offer long-term parking. Shrewsbury, Brentwood and North Hanley offer long-term parking on the Missouri side.